Many of you might remember back when I talked about my unfinished kitchen island and my uncertainty about how I was going to finish it (or if I was actually even going to keep it). 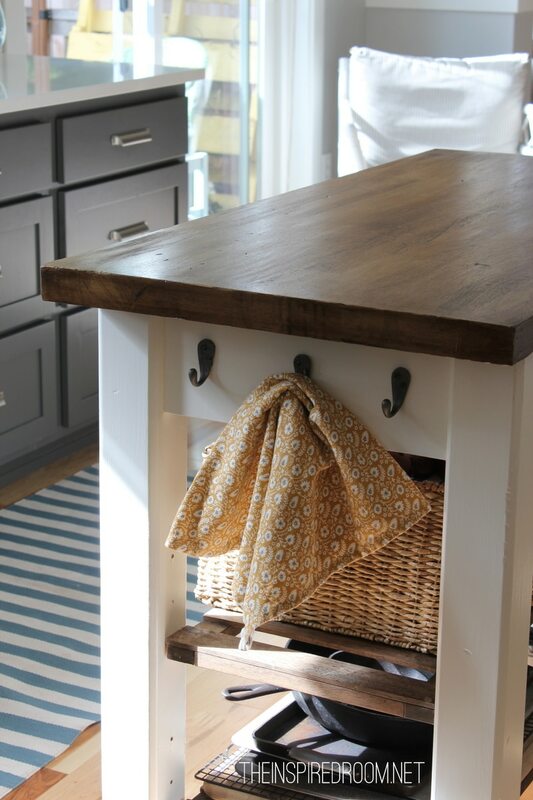 Well, as you probably saw in the recent kitchen reveal, I finally made up my mind — the island not only stayed in the kitchen but it got a new distressed antique furniture look! 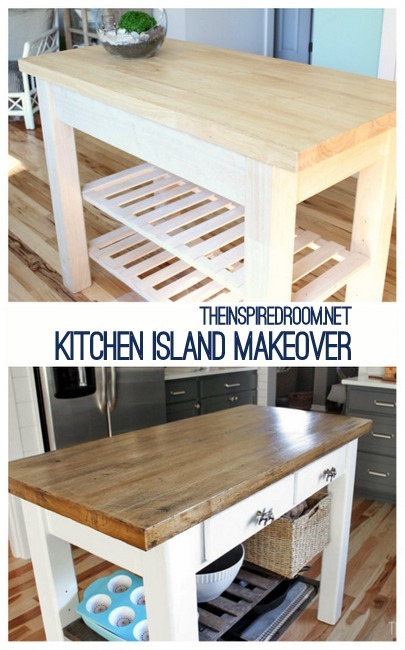 Did refinishing the island take special DIY blogger super skill, fancy tools or equipment or a workshop where you have to wear a safety mask and goggles? Nope. Not at all! This was EASY. 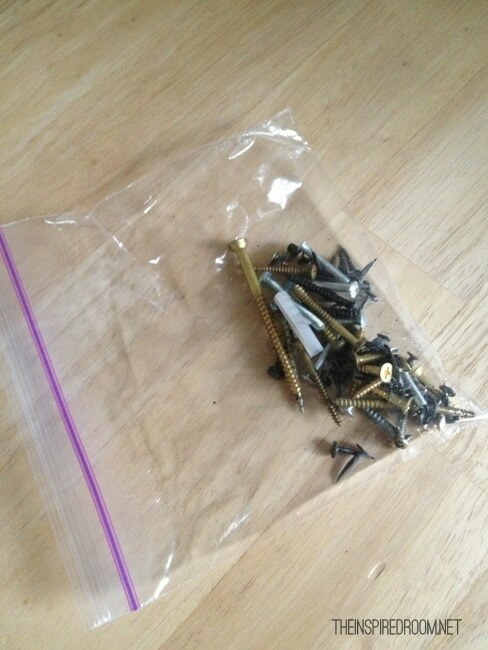 Unless you consider a bag of screws, a hammer and a can of stain scary DIY supplies. Just a simple, unfinished piece of furniture. (Sitting on hardwood floors with holes, heheh, all prior to the new floors). Ideally we would have wanted a real antique table from a thrift store or something, but we already had this island (it was given to us) so it was free. Free is good. Very good. So we cheated and made it into what we wanted, an antique! If you can find an affordable new island or table that works for you but is a little “too new” looking or not exactly what you want, you can make it look older! Easy peasy! Or if you are so inclined, you could build one or have someone build it for you. 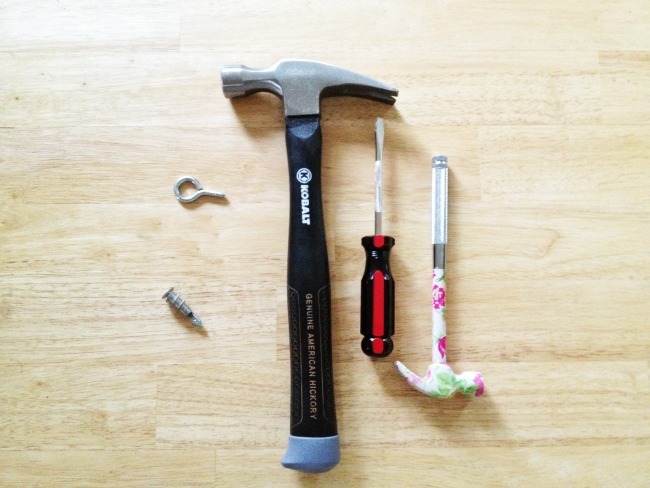 Here are the basics of what we did to distress this piece and how to do it yourself! 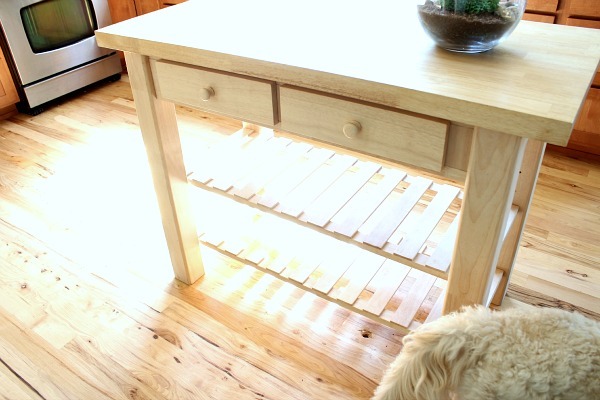 1) Start with an unfinished piece of furniture. Obviously you can also use a finished piece too. 2) If you want a time-worn look, beat up the top. You do not have to beat up your counter top if you don’t want to. My old wood kitchen counters were smooth and pretty like a brand new piece of furniture. That was the look I wanted for that kitchen and we loved it. But for this island we decided we wanted a more rugged contrast from the pretty white countertops. We wanted something that had a bit more character and that “been there a long time” look, something we could abuse without fear! Reclaimed wood is cool looking so we decided that was kind of what we were after. So to get started, we grabbed our furniture stain, a few tools and started wrecking the top of our island. It was therapeutic, actually. 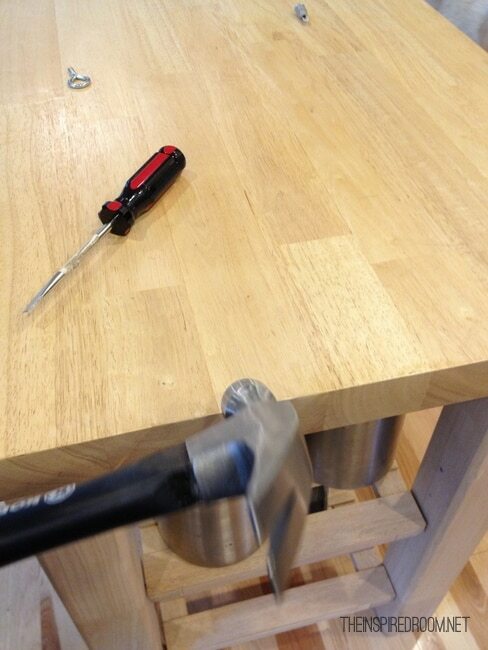 You cannot mess this up unless you accidentally hit your thumb with the hammer. And, those screws are SHARP so be careful when you start beating your island up. We really scratched and gauged the top A TON using our high tech skilled DIY’er tools: a piece of sandpaper to rough things up, a baggie of screws and nails (just hit the baggie on the counter surface), and a screw driver and hammer to dent it. What was REALLY effective for us was this FUN but loud technique: use the hammer to soften the edges of the counter and wear it down in a few places. Just hammer away around the edge of the counter and see how cool it looks! We also just grabbed screws and screw drivers and dinged the top up in random places. 3) Next we sanded any sharp or rough places with a sanding pad so it was smooth (but still dented and scratched) and then wiped it down with a cloth to remove all the dust. 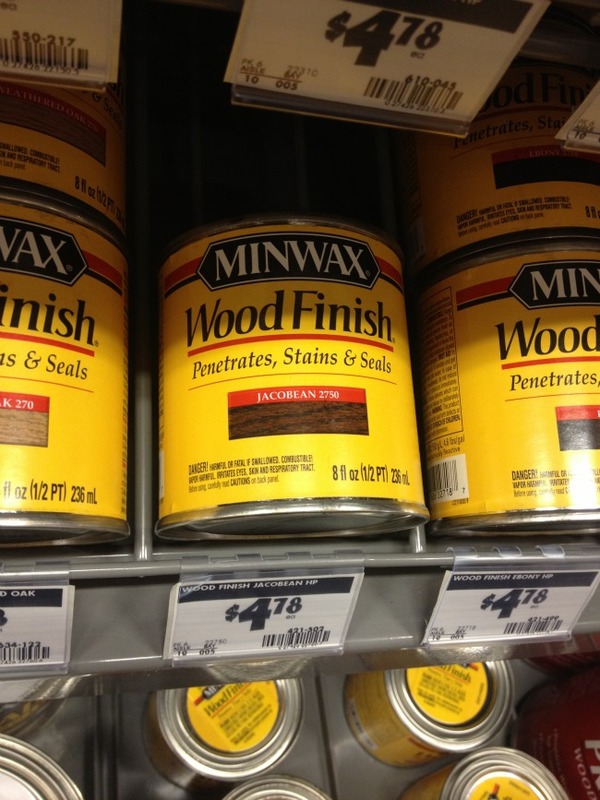 4) The stain we chose was Minwax Jacobean. We wanted a medium to dark rich tone for the wood so this one seemed perfect. We put the stain on with an old brush and a foam one (really you can use whatever you have but something old and not fancy is all you really need), let it sit for awhile (follow the directions on the can) and then wiped the excess off with a cloth. I think we repeated that about four times, waiting a few hours to a day or so in between each coat. You can judge how many applications you need, if your piece accepts the stain right away once might be enough. Ours was stubborn because it had been previously sealed. You’ll notice the stain will settle in the distressed parts. Those areas will become much darker than the rest, so be aware. That is the look I wanted, but if you want consistency in the color then you might not want to distress it. 5) I finished up the top with Aqua Spar to give it a nice water resistant finish (you know, to protect all the beautiful damage we inflicted on the top, haha). Maybe this part was unnecessary but I’m not a pro at this and I probably do random things I don’t need to. 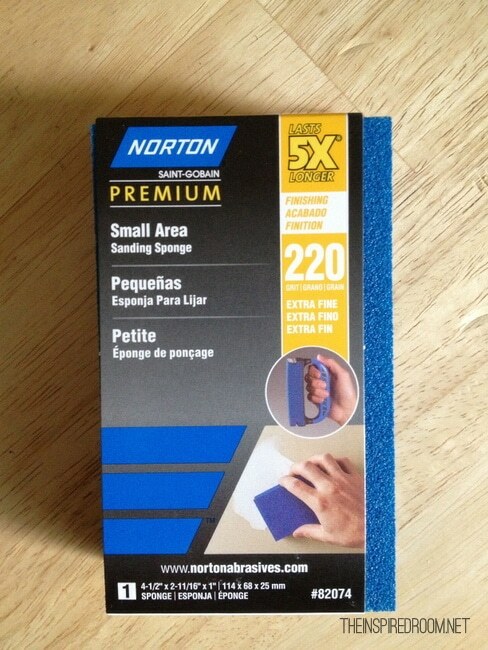 This was the product we used on our unstained cherry counters in our old house so we just decided to use it here. Just because. 6) After the counter top was done, we painted the legs and body of the piece with dove white, the same as our white cabinets. We deliberated on all sorts of colors but in the end, simple and white won out. We didn’t want the paint to look shabby so we didn’t go for that chipped or peeling paint look, although we did distress the legs a bit with our techniques mentioned above so the entire piece would look aged. And for a little more fun (and because painted white shelves would have been a pain in the rump to keep looking good) we stained the shelves with stain too. 7) Lastly, we personalized the piece by removing the wood pegs and knobs and adding our own favorites: Brass Anthro animal knobs and Rejuvenation hooks on the side — perfect for hanging towels or oven mitts! I’m quite pleased with it and how it added so much character to our kitchen! PS. The kitchen source and detail post will be out probably Monday, I’m almost done! 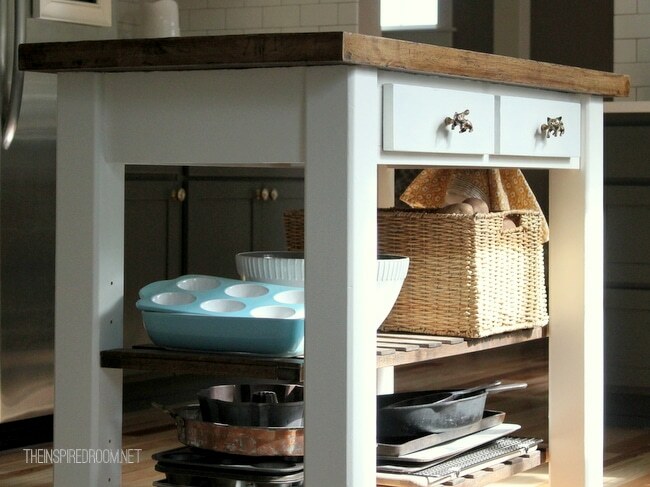 For more kitchen island inspiration, check out this post! 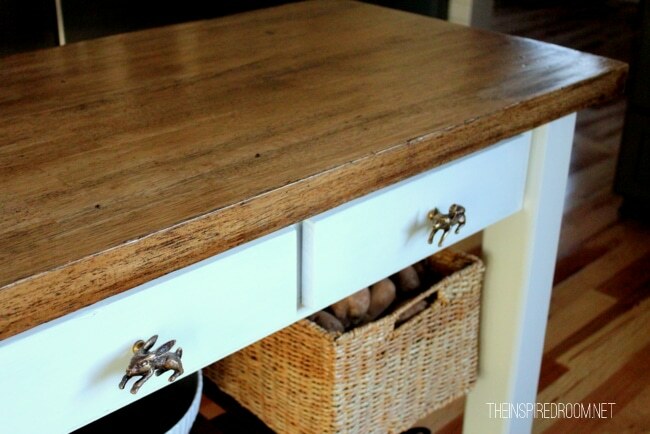 And for a helpful tutorial and video on how to make new furniture look old, check out Young House Love’s post! I love what you did with this! I have a fifteen year old item which was painted white when I got it and had a kind of natural looking wood with a clear coat on it. I have been thinking for a long time I wanted to do something like this to it and now I know I do. Your vision and creativity turned this ho-hum island into a one of a kind…. great DIY post – an inspiration! absolutely perfect piece for your kitchen…and an absolutely perfect way of achieving the look! :) love it! Looks awesome. Come link it up in our party! It looks amazing! I remember wondering what you were going to do with the island, but forgot about it in the kitchen reveal because I was too distracted by everything else, lol. 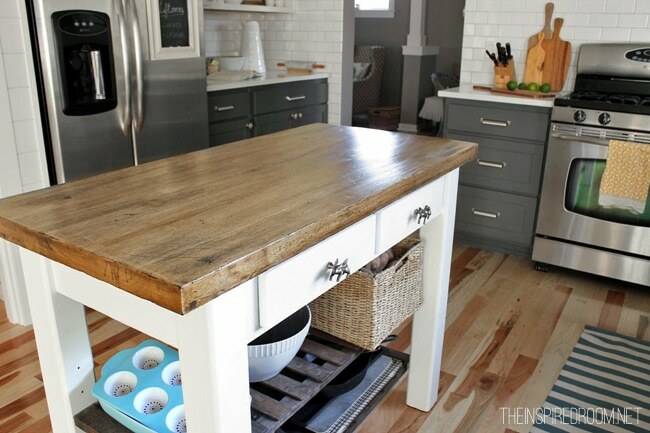 I can hardly believe that is the same kitchen island! I never would have thought to DIY my own island. Brilliant job! It’s looks great… Perfect for your kitchen! I thought it was an antique! 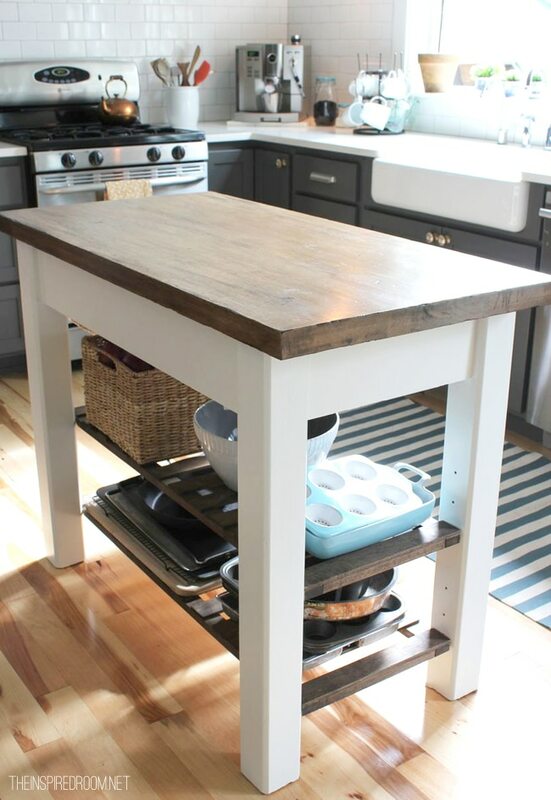 We recently had a kitchen island with a butcher-block top (looks almost identical to yours) made for us this past winter, and it’s been sitting unfinished in our kitchen while I make up my darn mind about what to do with it. Great inspiration! I love how it turned out. This turned out beautifully, I have taken a hammer to pieces of furniture to beat it up a bit and it works great especially on the edges. I am glad you kept this it looks perfect and I love the contrast. I like it, although I always liked white bottoms with wood tops! Love the island! Where do you buy Aquaspar? I’m thinking about using it on my kitchen table that I refinished and put Polycrylic on top. One of the edges has become kind of gummy and I need to find a fix. This product sounds great! I just found your blog and I LOVE it. Your kitchen remodel is beautiful. 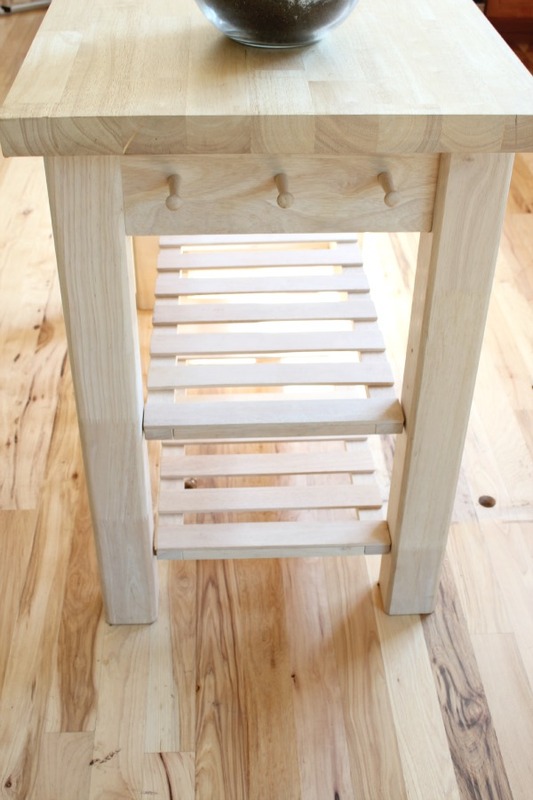 Thank you for the simple step by step details of how you did your kitchen island. I am dying to try it myself. What a fantastic DIY project and it looks so easy! I think this is the ideal project for anyone who is stressed out with life, family or work! 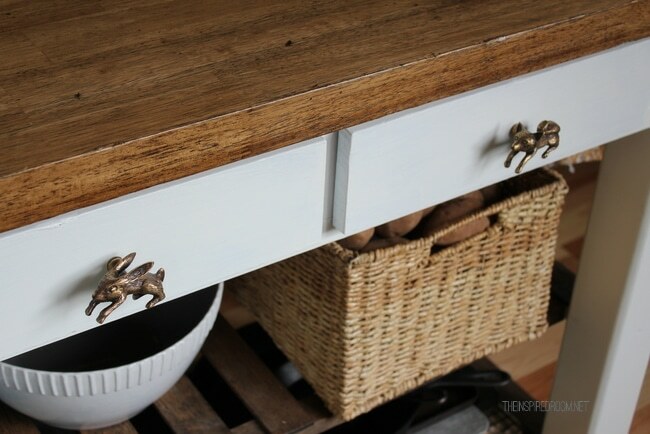 And I love those animals knobs, great finishing touch! Thanks for posting! Beautiful job on the kitchen and the island!! Just wonder if you have any idea where the island was purchased? That is fabulous – It really looks vintage & perfect! Melissa, Any idea what store your unfinished island came from? I really want to find the same one! Hi Melissa, I have been wanting for this island for more than a year. I wanted to replicate what you did since it was so perfect for my kitchen. I found the island at Walmart (of course, right?!) but opted for the smaller version with one drawer since my kitchen is on the small side. It’s perfect!!! I actually distressed the bottom of mine but stained the top similar to yours. Thanks for such great inspiration!